Removed from the hustle and bustle of Dublin City, Barberstown Castle is a 4 Star property built in the 13th Century, which provides guests with the unique experience of a Castle and Country hotel only 30mins away from the airport and Dublin city centre. The personal service of our dedicated staff will ensure that your stay is comfortable and enjoyable. 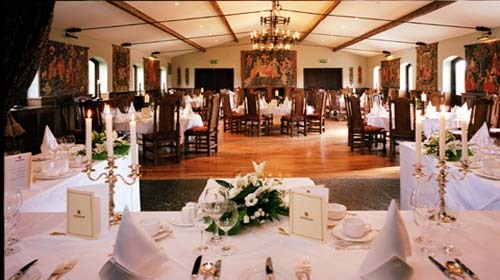 The Restaurant at Barberstown Castle is renowned for the quality of its food and service. Inviting public rooms range from the original Castle keep to the soft warmth of the drawing room, tearooms and cocktail bar. All the bedrooms are elegantly and luxuriously appointed, laden with antique furniture and provide the highest standard in comfort. Relax in an atmosphere of pure calm and tranquility enjoying open log fires, great food and convivial company. A myriad of outdoor county pursuits such as horseback riding, historical and heritage interests and shopping in Dublin are all on our doorstep. A Golfer’s dream can be arranged with unforgettable golf at the K-Club (1/2 mile) or Carton House (15 minutes). Music, candles, fine wines, open fires, good food and convivial company. Every night is a special occasion at Barberstown Castle. For a memorable special event, private dining suites are available. To reserve a private room your next event contact Lee-Ann or Gretchen at 01 628 8157. Sunday, Monday and Tuesday nights, dining is available in the Tea Rooms restaurant. Last orders are at 8:30pm. The Castle has 59 ensuite bedrooms, a number of which have Four-Poster beds. All the bedrooms are elegantly and luxuriously appointed, laden with antique furniture and provide the highest standard in comfort. 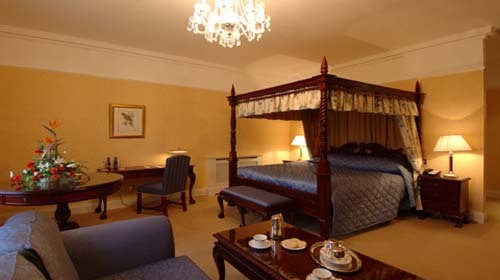 The bedrooms have been named after the owners of Barberstown Castle whose home it has been for the past 718 years. Click here to read the history of Barberstown Castle. Guests can enjoy refreshing traditional Afternoon Tea or a light Lunch in the Tea Rooms and outdoor terrace overlooking the landscaped gardens of Barberstown Castle. The A la Carte menu which includes Afternoon Tea also features open sandwiches, a selection of cold and hot dishes, desserts and an extensive wine, tea and coffee list. A fire burns cheerily in the huge hearth and light, glass covered wicker tables, deep couches and comfortable chairs make the room cosy and inviting. Paintings by local artist Susan Harris complement the unpretentious and comfortable surroundings. The Tea rooms are open from 10:00am each morning with Lunch served from 12:00pm and last orders at 7:00pm. For residents a Table d’hote menu is available on Monday evenings until last orders at 8:00pm. Barberstown Castle, a country meeting place close to Dublin City Centre, has a range of Conferencing suites which cater for groups from 2 to 200. 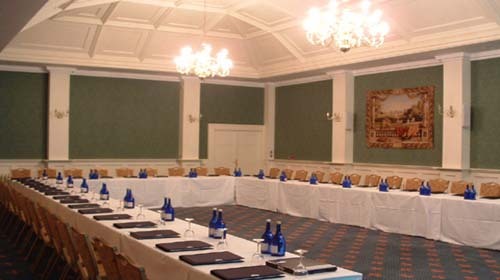 The Classical Garden Suite can cater for up to 100 delegates and a wide variety of different layouts. The personal service of our dedicated staff will ensure that every event is professional, comfortable + productive. Click here to download our conference pack or fill out the form below to sign up to the conference newsletter. Barberstown Castle houses two unique rooms each in a very different style, one medieval and the other classical. A warm welcome…awaits your guests with open log fires in our Medieval drinks Reception dating from 1562. Medieval Tapestries… adorn the walls and are highlighted by beautiful candelabras. Antique gothic oak furniture and original exposed beams set the atmosphere for the most special day of your life. Toast your friends…In your own exclusive Medieval Outdoor Courtyard with a beautiful gothic gazebo and built-in BBQ area. Your noble guests…will dine in the Unique Medieval Banqueting Hall Featuring vaulted ceilings and medieval iron chandeliers. Enjoy your first dance together…on our beautiful oak dance floor surrounded by Medieval Tapestries and Gothic oak paneling. Located only 30 minutes from Dublin City Centre and from Dublin Airport, a stay at Barberstown Castle affords guests the experience of a relaxing and luxurious historic country house hotel with close proximity to the bustling Capital City of Dublin. Barberstown Castle is an integral part of the village of Straffan, whose name in Gaelic ‘Sruthan’ means ‘The Stream’. A quaint village, Straffan offers the best of the traditional Irish village experience with its sprawling fields, quirky local characters and unique shops and activities to amuse and entertain. There is something to suit all guests staying at Barberstown Castle. Barberstown Castle is famed for it great location as much as for its luxurious and unique country house hotel offering and welcome. 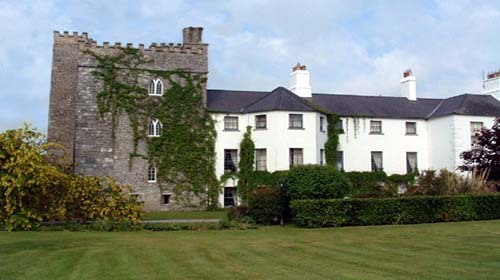 Built originally in the 13th Century it is the only property which can boast such close proximity to Dublin City Centre and Dublin Airport (both 30 minutes away) while simultaneously providing guests with the sophisticated and relaxing experience of a 13th century castle experience. • Travelling west on the N4 from Dublin, take the turn for Straffan at Maynooth and follow the signs for Barberstown. • Travelling south on the N7, take the turn for Straffan at Kill and follow the signs for Barberstown.